IDC Vertical (10-160m). The default HamSphere 4.0 antenna. The HamSphere IDC antenna is the first basic antenna that ships bundled with the HamSphere 4.0 transceiver installation. IDC is an abbreviated acronym for "Inverted DisCone". 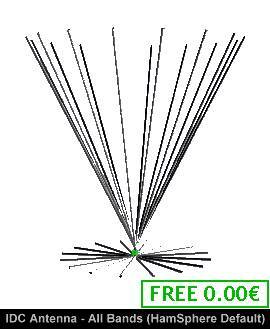 A typical Discone antenna is quite commonly used for VHF/UHF and Microwave. Although it is not so common on HF, it has been used primarily for HF civil aviation and military applications. The HF variant of a Discone antenna is massive in structure and hence is not too easy to use and build by average Amateur Radio operators. 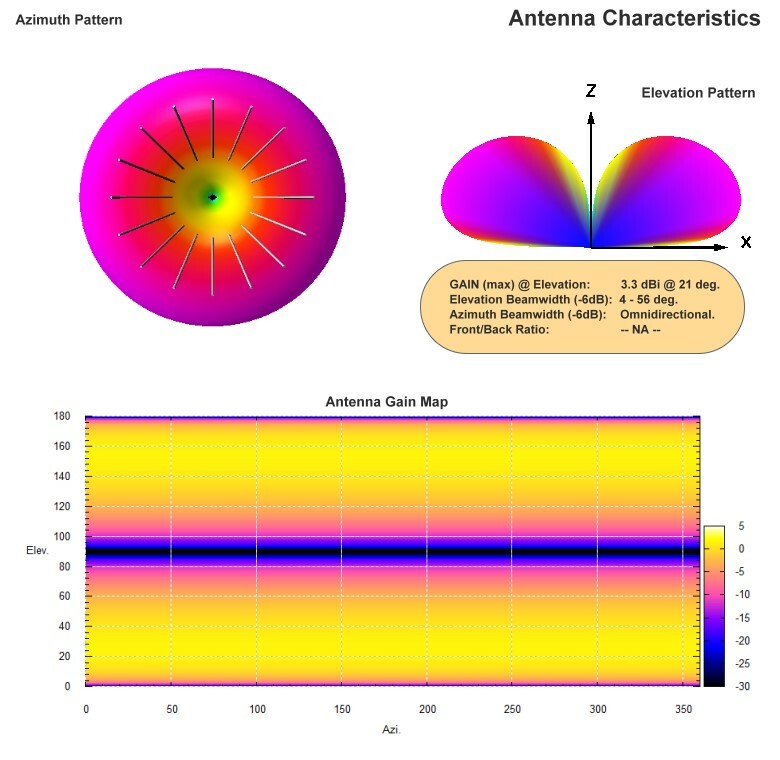 The biggest advantage of a Discone antenna is its omni-directional radiation pattern and a very broad bandwidth capability which spans typically over more than three to four octaves. Prior to the launch of HamSphere 4.0, during the design stage; we examined several design options before choosing the Discone antenna to do the job of our primary antenna. We however made several design alterations, one of which was to vertically invert the structure and therefore the antenna got its name as "Inverted" Discone or IDC. The IDC design topology yielded far better radiation pattern on HF in comparison to the regular Discone arrangement. We could derive a complete HF band coverage from 160m to 10m band with our IDC antenna. The HamSphere 4.0 IDC antenna provides approximately +3.3dBi omni-directional gain across the entire HF spectrum with low takeoff angle capability. The performance of our IDC antenna is far superior to the standard 1/4 wl vertical Groundplane antenna and is quite similar to that of 5/8 wl Vertical but with a full HF broadband coverage unlike regular vertical antennas. Structurally, the IDC antenna is 165 feet tall with upper skirt diameter of 230 feet. The inverted conical structure as well as the lower horizontal disk comprise of 256 copper wire segments each. In the real world, this HF full band IDC antenna would be a very large and an expensive proposition. The IDC is a very good performer in its class and by no means a trivial antenna.